I was taken to the Delaware County shelter when my owner was moving. The shelter quickly called HHGDR to come for me. 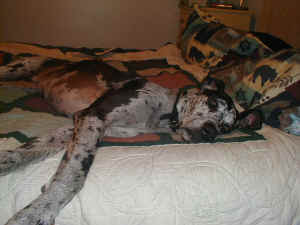 I was not at the shelter long when a wonderful family came to adopt a Dane. 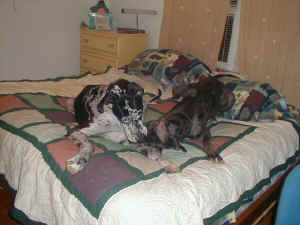 Luckily for me they fell immediately in love with me and now I have a great family and even a sister Dane. 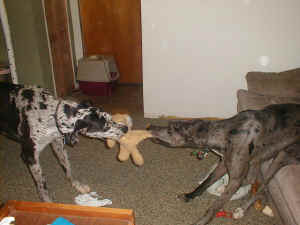 Josi and I playing tug o war. I guess I should let her win occasionally. I love my new toys!!! Okay she has the toy but I have the couch! NOPE, I am NOT going to let her win!! !